Part I: A Map of the Territory: The World, Knowledge and Models. Translating Experience. Modeling and Mining: Putting It Together. Part II: Business Modeling: What is a Model? Framing Business Models. Getting the Right Model. Getting the Model Right. Deploying the Model. Part III: Data Mining: Getting Started. What Mining Tools Do. Getting the Initial Model: Basic Practices of Data Mining. Improving the Mined Model. Deploying the Mined Model. Part IV: Methodology: Methodology. Resources. 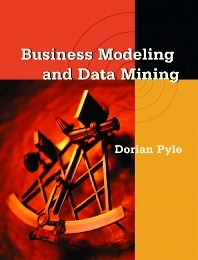 · Teaches how to discover, construct and refine models that are useful in business situations · Teaches how to design, discover and develop the data necessary for mining · Provides a practical approach to mining data for all business situations · Provides a comprehensive, easy-to-use, fully interactive methodology for building models and mining data · Provides pointers to supplemental online resources, including a downloadable version of the methodology and software tools. Data miners, data analysts, marketing and financial analysts. Dorian Pyle is Chief Scientist and Founder of PTI (www.pti.com), which develops and markets Powerhouse™ predictive and explanatory analytics software. Dorian has over 20 years experience in artificial intelligence and machine learning techniques which are used in what is known today as “data mining” or “predictive analytics”. He has applied this knowledge as a consultant with Knowledge Stream Partners, Xchange, Naviant, Thinking Machines, and Data Miners and with various companies directly involved in credit card marketing for banks and with manufacturing companies using industrial automation. In 1976 he was involved in building artificially intelligent machine learning systems utilizing the pioneering technologies that are currently known as neural computing and associative memories. He is current in and familiar with using the most advanced technologies in data mining including: entropic analysis (information theory), chaotic and fractal decomposition, neural technologies, evolution and genetic optimization, algebra evolvers, case-based reasoning, concept induction and other advanced statistical techniques.